Foals should be abel to be led like adult horses. 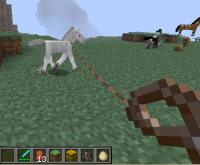 When I try to lead Foals they alwas turns one spesific way (either exactly North, south, east or west) They dont walk towards me until they have to due to the distance. If they then walk towards me they stay turned to "their" direction. Bug stops as soon as the foal is fully grown. Game does not crash, so no crash report. In 1.6.1 leading foals worked perfektly for me.